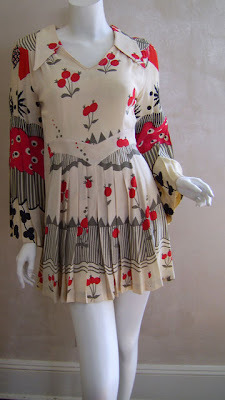 On 7 April, this beautiful Ossie Clark dress was for sale on a buy it now for only 250$-which is about £125.00!! It was only up for 2 hours when it got snapped up!! What an unbelieveably brilliant bargain!! I have my eye on the Honolulu one even though most people would think it's a big don't! please tell me it was a teeny tiny size so i can feel better knowing i missed an ossie for $250... please?!? well, someone is very happy! 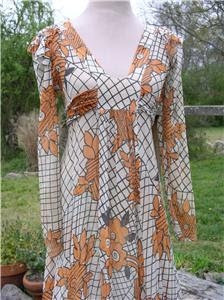 Hi Wendy-I think its absolutely gorgeous and if I could I would snap it up along with the one in the first picture!! Hi Jennifer-Yay, I've just rechecked, it did seem a small size-certainly on top-bust 32 inches with narrow mutton sleeves. This would have ruled me out too! 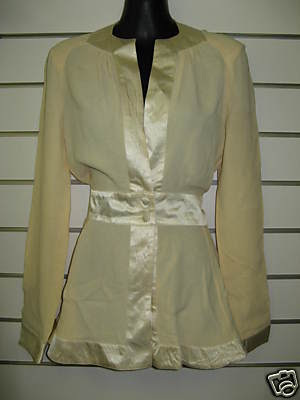 ^^ when there are "narrow" sleeves they are REALLY narrow. I've encountered some I can't even get my arms into. People used to be tiny on top.